CryptoWall 2.0 ransomware uses sophisticated techniques to infiltrate computers and hide from its victims. Use Reimage to determine whether your system is infected and prevent the loss of your files. Can I remove CryptoWall 2.0? CryptoWall 2.0 virus is a treacherous ransomware which infects PCs and then locks out the valuable confidential information. However, this is only the beginning of major problems. The virus presents you a ‘solution’ – pay the required ransom in order to return the data. We highly discourage you to do make the transaction. You will pay the money, but you may never see the encrypted data again. Thus, brush away naïve hopes and face the reality. 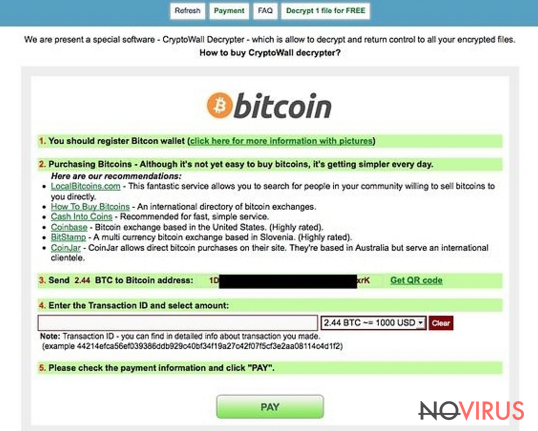 Consider of CryptoWall 2.0 removal before the virus paralyses your system completely. You can confront the virus by installing a reliable anti-spyware program, such as Reimage. CryptoWall 2.0 has come into daylight after its predecessor CryptoWall has struck the virtual world. The original version targeted corporations and companies as well as individual users all around the world. The victims went spare after finding out that highly important data had been blocked. Desperate to retrieve the data, corporations had paid millions of pounds to the developers of the virus. Overall, the cyber criminals have managed to collect stunning amounts of money. Thus, it didn’t take too long for them to release the update version – 2.0. • eliminating original files. While the original version encrypted the existing files, the latter deletes the original ones. In other words, in case you manage to retrieve the data, you receive the copies of the encrypted data. • using Tor gateway. When a virus delivers a message informing of the deed, it instructs the victim to download a Tor browser and then to make the transaction. Likewise, such peculiarity burdens the detection of malware source. • creating unique bitcoin payment address. 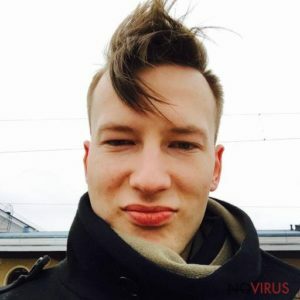 In previous version, you could exploit the payment numbers of other users in order to retrieve the data, but now CryptoWall 2.0 malware creates unique wallet ID, thus forcing you to pay the money. Though IT security specialists have almost managed to terminate the older version, cyber criminals pose new challenges by releasing more ransomware. If you got infected with the virus, it is necessary to remove CryptoWall 2.0 as soon as possible. Before terminating it, it is vital to know how the virus spreads. Like previous version, CryptoWall 2.0 ransomware mainly attacks users via spam attachments. Beware of the attached email with this file — ATTN: Invoice J-98223146. It seems like the message is sent from a tax company: ‘Please see the attached invoice (Microsoft Word Document) and remit payment according to the terms listed at the bottom of the invoice.’ If you notice any similar characteristics, do not open it! In any case, if you get a similar message with an added invoice, stay alert, as it may be a trap. If you have doubts whether the company sent you the invoice, you can always inquire them directly. Thus, the risk of getting infected with a ransomware decreases. Terminating CryptoWall 2.0 virus might not be an easy task if you opt for manual removal. If you do not specialise in programming, then automatic removal might be the right choice. After you install a powerful anti-spyware program it completes CryptoWall 2.0 removal. After it finishes the elimination, turn on your anti-virus program and scan the system anew. Make sure you update the anti-virus and anti-spyware programs daily. This time, the personal data might have been lost, but now you can back-up your data in order to prepare for possible future ransomware attacks. Sign in to your account and launch any Internet browser. Download a legitimate anti-malware software, for instance, Reimage. Make sure you update it to the latest version and then run a full system scan with it to detect and eliminate all malicious components of the ransomware to remove CryptoWall 2.0 completely. In a new window that shows up, click the Next button and choose a restore point that was created before the infiltration of CryptoWall 2.0 and then click on the Next button again. After restoring the computer system to an antecedent date, install and check your computer with Reimage to uncover any remains of CryptoWall 2.0. It is strongly recommended to take precautions and secure your computer from malware attacks. To protect your PC from CryptoWall 2.0 and other dangerous viruses, you should install and keep a powerful malware removal tool, for instance, Reimage, Malwarebytes MalwarebytesCombo Cleaner or Plumbytes Anti-MalwareMalwarebytes Malwarebytes. This post was published on 2016-04-11 at 14:59. Category: Browser hijacker, Ransomware. You can quickly scan the QR code with your mobile device and have CryptoWall 2.0 virus manual removal instructions right in your pocket. What method did you use to remove CryptoWall 2.0 virus? Cannot remove CryptoWall 2.0 virus?